Or at least his coats. I don’t know about you, but as the summer weather warms up, I like to think wool. I’ve got menswear to sew and desires beyond my knowledge, skills and abilities. Making a wool coat for an event in August seems like a patentable Bad Idea, so it’s a good thing that I have a nice piece of Italian linen-cotton denim-like fabric that I’ve set aside to make a summer-suitable coat for Mr S.
There is a Rhode Island coat, in a Rhode Island collection, of which I am particularly fond. I’ve had this coat in mind for some time now, and have inflicted it upon have shared it with experts several times. It has a lot to recommend it: a soil mark on the collar, extensive damage and repairs to the left sleeve, fading and wear on the back, fragments of botanical material in the pocket lint, and the nicest linen fabric I’ve ever felt. This is the coat I wanted to make for Mr S, but then I started thinking about that waist seam, which eliminates this from the style competition for 1812. Rats! But, OK, no reason that we can’t use this as inspiration and make a coat using the fabric but not the waist seam. So I looked at another coat that just happened to be handy (I know, I am very lucky, and that’s part of why I’m sharing this with you). At first glance, I thought I was good. And by glance, I mean extended looking. But look again: there is a waist seam, it’s just harder to see. So much for the iPhone and lousy light, right? (I noticed the seam today, in even less light, so go figure.) This coat is made of a single twill off white wool can easily be mistaken for plain weave and that is rather light. Very summery, in a way. This is a nice detail, but one I’m not familiar with. 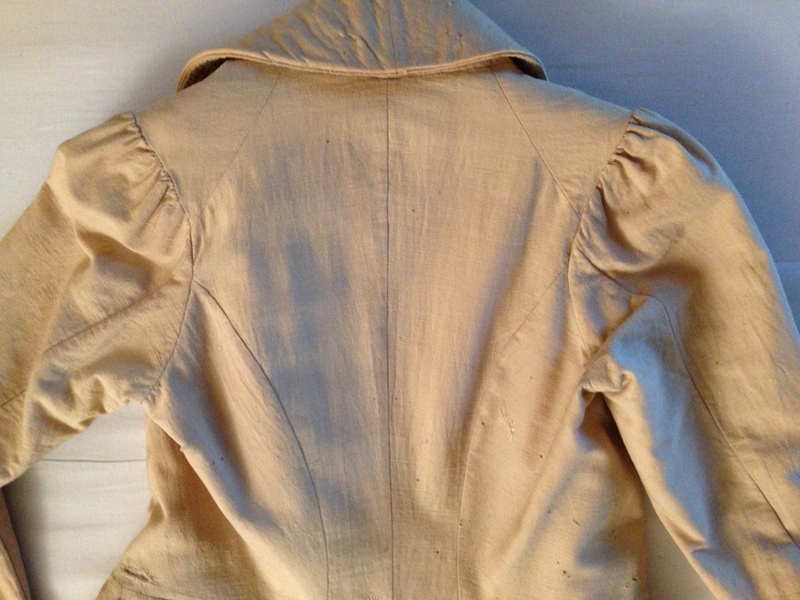 The fashion plates on Serendipitous Stitchery’s post do show increasingly full sleeves in the early years of the 19th century, but that detail didn’t fully register with me until I looked at this coat and processed what Mr C had told me about sleeves and shoulders. Seeing an extant example always makes principles more real. So what next? At work, I’ve started updating the catalog records for these coats, and they’ll go live early next month. Every time we learn something new, we try to update and correct records so that everyone can benefit. That’s the easy part. The hard part is reconciling style details for Mr S’s coat. In comparing these examples with fashion plates, I think it’s clear that they are both later than 1812 (waist seam) and nodding to but perhaps not fully embracing high style (see the gathers on the white coat, but the blue coat has only one gathered sleeve, which I attribute to maker error). Plausible dates for both might be 1818-1826, bearing in mind that these will be interpretations of styles, the way Old Navy knocks off adapts its sibling Banana Republic’s styles. I may be back at that fabulous checked linen coat at the Met, with inspiration drawn from Providence’s plainest blue coat. The process always seems a compromise, in part because I do not think Mr S wants a checked coat, and in part because I’d like to use fabric I already have. Still, there is yet another coat to think about…but tomorrow is another day. Thanks for the link back! I really love the blue checked one its a favorite :). Wow! I’ve never seen that blue coat! Just gorgeous, and boy the wearer must’ve been skinnier than Ichabod Crane! Just look at those tight armscyes! 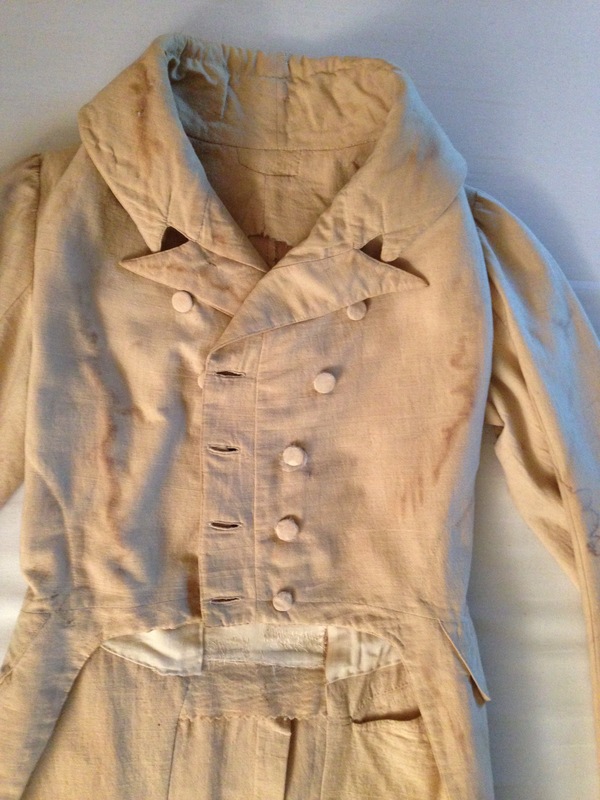 Would the unlined blue silk summer coat in Fitting&Proper be too early for 1812-ish? It’s a lovely coat. And surely you have a few yards of navy silk taffeta in your stash, doesn’t everybody? The Strategic Fabric Reserve does hold two yards of dark blue silk taffeta, of course! I thought there was a ca. 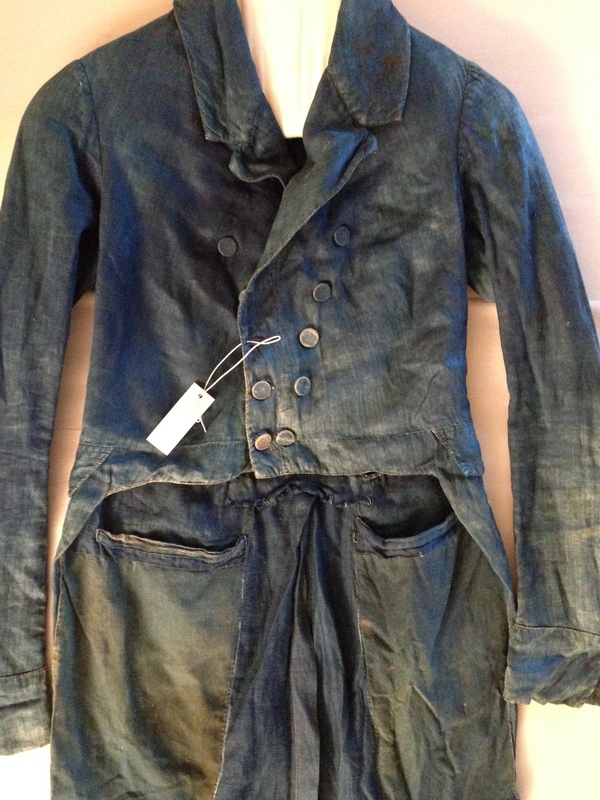 1800 coat in Fitting & Proper. This would work well for Mr S; I’d rather make up something too early than too late. A man might stick to his favorite coat but he couldn’t time travel. Thanks! I thoroughly enjoyed this post. The first coat is truly beautiful, especially because of the signs of wear and tear and ‘botanical material’ in the pockets!! !